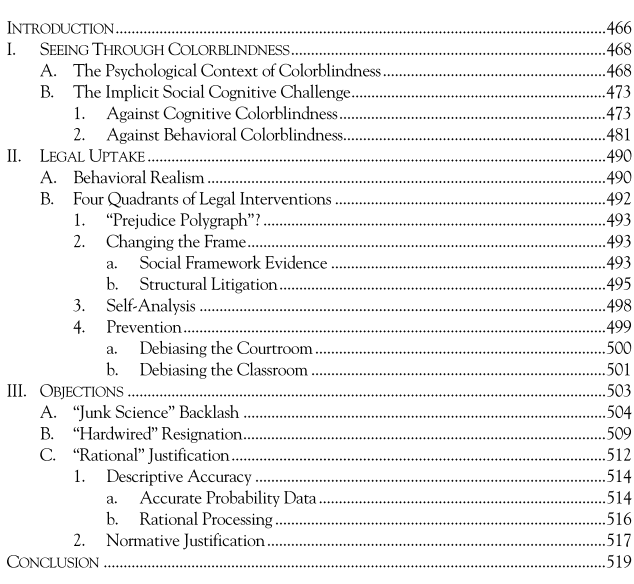 Seeing through Colorblindness: Implicit Bias and the Law, 58 UCLA L. REV. 465-520 (2010) (with Kristin Lane). Once upon a time, the central civil rights questions were indisputably normative. What did “equal justice under law” require? Did it, for example, permit segregation, or was separate never equal? This is no longer the case. Today, the central civil rights questions of our time turn also on the underlying empirics. In a post-civil rights era, in what some people exuberantly embrace as post-racial, many assume that we already live in a colorblind society. Is this in fact the case? Recent findings about implicit bias from mind scientists sharply suggest other-wise. This Article summarizes the empirical evidence that rejects facile claims of perceptual, cognitive, and behavioral colorblindness. It then calls on the law to take a “behaviorally realist” account of these findings, and maps systematically how it might do so in sensible, non-hysterical, and evidence-based ways. Recognizing that this call may be politically naive, the Article examines and answers three objections, sounding in “junk science” backlash, “hard-wired” resignation, and “rational” justification.